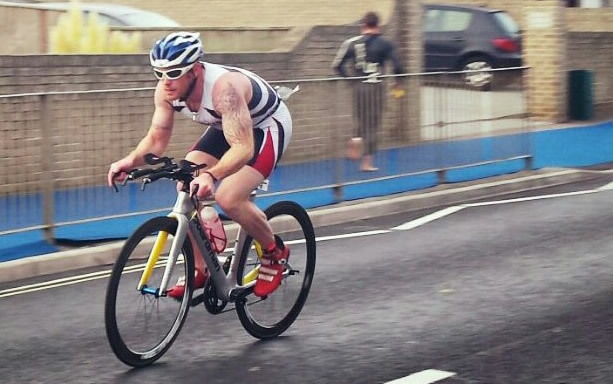 Tri247 columnist Karl Alexander had a very unusual race for him at Challenge Weymouth, and not in a good way. Despite a mindset of 'pain is temporary; quitting lasts forever', for the first time in 20 years, he had to abandon a race. Well, they say you have to take the rough with the smooth - and so here Karl reports on how his day (well, half of it), started well and then ended in disappointment. Still, having won The Gauntlet last year, he'll certainly be motivated for the upcoming race at Hever Castle... and hoping to return a more positive report in two weeks time! 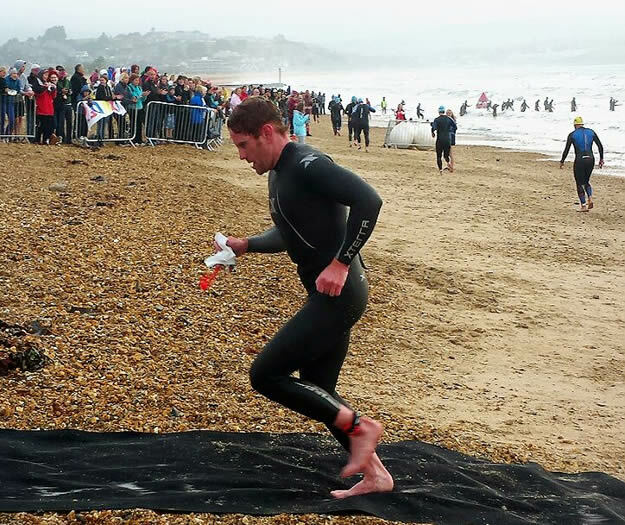 Challenge Weymouth was to be my second iron-distance race of 2014 (Ed. Karl also raced The Outlaw), but my first racing in the PRO category. My build-up for the event had gone well, and driving down to Weymouth on Saturday morning I was quietly confident of a good result. On arrival we headed straight for the Pavilion for registration and after just a few minutes I was fully equipped and ready to race, and after a short drive to Lodmoor Country Park I was racking my bike in transition. In transition I chatted with my ERDINGER Alkoholfrei team mate Tom Vickery and we discussed our respective race strategies. 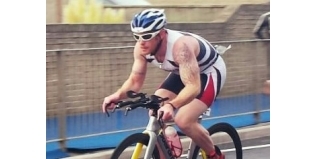 I have begun to train with power and Challenge Weymouth would be my first race paced off power and heart rate. I have found in the past that I tend to play to my bike strength a bit too much and go out quite hard, so the power meter and heart rate would keep me reigned in and allow for a (hopefully) faster run. Race morning arrived and as we drove to the start I couldn't help notice the wind, it was coming in off the sea and was quite strong. As I went about my pre-race checks, tyre pressure, water bottles etc. I chatted with Joel Jameson and as we spoke the announcement that, due to the conditions the swim would be halved to 1.9km on a two lap Australian exit style course was met by both of us with a broad smile. This was a real game changer; I'm not a noted swimmer and suddenly I wouldn't be giving away 5-6 minutes in the swim to my opposition. The swim was tough - living in land-locked High Wycombe I don't get to swim in the sea very often and in conditions like those any sort of technique worked on in a pool or glass flat lake went out the window. Getting past the breakers was hard, but after 200 meters or so of fighting it was a bit calmer. The return back to shore was equally fun, with the waves coming over the top of you. I tried to ‘surf' the waves back in but messed it up more often than I got it right – sea swimming is definitely an art form and one I'll work on before next year's event. Coming out of the water in 19th place I had some work to do on the bike, but I was confident in my strategy and kept to my guns. Within a few miles I had overtaken a few riders and in turn had been overtaken - this was tough for me to see riders disappear out of sight but I stuck to my plan. Once I was settled and in a good rhythm I started to think about nutrition. Taking a drink from my bottle, I felt all was not well and immediately gagged it back up. My first thought was that my energy drink was bad; I was doing the old trick of using my oldest bottles and swapping them out for nice new ones – so at the first aid station I jettisoned the old and grabbed a new. I took a swig. I gagged. It all came back out. I wasn't concerned at this stage and pressed on. 10 minutes later I tried again. Same result. I tried to be calm and level headed and kept riding. Just before the dead turn on the course I saw Tom Vickery just ahead, he'd had a better swim but I had caught up in around 20 miles, I had also caught a couple of guys that had overtaken me early on – this pacing lark works!! Despite zero calorie intake I was feeling good and soon closed the gap and passed Tom, I knew that he would accelerate and pace off of me – at the Outlaw I discovered that Tom isn't a fan of explosive changes of pace so if he was still with me at 80 miles I would burn as many of his matches as I could, but for now I was happy in my rhythm. 40 miles came and went and I still was unable to keep anything in. I was started to feel nervous, my legs were feeling heavier, my heart rate and power were dropping by a few watts and beats. Nothing too concerning at this stage but I knew if I didn't get something in soon, I be done. I slowed up and allowed Tom past, I sat up and tried to drink. Out it came. I started to think of the rest of the race. I still had about 60 miles to go and a marathon. I decided to see the lap out and make the decision then. I started the second lap, but on the large climb out of Weymouth I stood out of the saddle and I was hit with a cramp in my right calf. I sat down and knew my day was done. I had moved up from 19th to 8th on the bike. I've been involved in endurance sports in one guise or another for nearly 20 years and I have never ever abandoned a race and despite the fact the man is a walking pharmacy, I hold by Armstrong's ‘pain is temporary; quitting lasts forever' mentality. It was a tough decision and for a few days after I moped about thinking ‘what if?' but I can't change the outcome, what's done is done. So now I look forward to my final two races of the year and set my goals for 2015 but one thing is for sure, I have unfinished business in Weymouth.